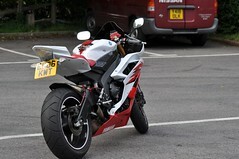 Well got the GP1 gps unit for the Nikon and decided to take it out to boxhill where all the bikers meet. It was only Saturday so not that many about. The GP1 unit is good but took a little while to get used to it. I also thought I would try Flickr which this picture has been uploaded from. So photo was taken with the Nikon D5000 and the GP1 unit so it has the geotagging info in it. Then I uploaded to IPhoto9 and then uploaded using that into Flickr. I then composed a blog entry with flickr so will be interesting to see how this comes out here on the blog. Decided it was time I got myself a digital SLR and saw the reviews on engadget of the new Nikon D5000. The price was good and I have been fed up with the camera on my HTC mobile, especially as I have been taking a lot of photos on my visits to the states. Jessops this weekend had a sale on so bought the camera, extra lense, 8gb SD card and you got a free bag as part of the deal. I ordered the GP-1 unit for it as well (although have to wait 28 days for that) so that I can store the gps position of the photo as this seems to be the latest fashion in the world of photography. DISCLAIMER: Paul Farrow is not responsible for any damage, direct or indirect, caused by the use of the information on this site. Use at your own risk.